Background Long-term immunosuppressive treatment does not efficiently prevent relapses of lupus nephritis (LN). This investigator-initiated randomised trial tested whether mycophenolate mofetil (MMF) was superior to azathioprine (AZA) as maintenance treatment. Methods A total of 105 patients with lupus with proliferative LN were included. All received three daily intravenous pulses of 750 mg methylprednisolone, followed by oral glucocorticoids and six fortnightly cyclophosphamide intravenous pulses of 500 mg. Based on randomisation performed at baseline, AZA (target dose: 2 mg/kg/day) or MMF (target dose: 2 g/day) was given at week 12. Analyses were by intent to treat. Time to renal flare was the primary end point. Mean (SD) follow-up of the intent-to-treat population was 48 (14) months. Results The baseline clinical, biological and pathological characteristics of patients allocated to AZA or MMF did not differ. Renal flares were observed in 13 (25%) AZA-treated and 10 (19%) MMF-treated patients. Time to renal flare, to severe systemic flare, to benign flare and to renal remission did not statistically differ. Over a 3-year period, 24 h proteinuria, serum creatinine, serum albumin, serum C3, haemoglobin and global disease activity scores improved similarly in both groups. Doubling of serum creatinine occurred in four AZA-treated and three MMF-treated patients. Adverse events did not differ between the groups except for haematological cytopenias, which were statistically more frequent in the AZA group (p=0.03) but led only one patient to drop out. Conclusions Fewer renal flares were observed in patients receiving MMF but the difference did not reach statistical significance. Lupus nephritis (LN) occurs in up to 60% of patients with systemic lupus erythematosus (SLE)1 and significantly impacts their survival.2 Randomised trials performed at the National Institutes of Health (NIH) indicated that long-term use of a combination of steroids and high-dose intravenous cyclophosphamide (CY) pulses was superior to steroids alone to prevent renal impairment.3,–,5 Based on these studies, the so-called ‘NIH regimen’ became the standard of care for LN for three decades, despite its many side effects such as a high rate of severe infection and premature ovarian failure. Two different therapeutic approaches have been recently proposed. First, mycophenolate mofetil (MMF) was shown to be at least as efficacious as oral/intravenous CY to induce a good renal response at 6 months in several pivotal randomised studies.6,–,8 Although long-term data are still unavailable, MMF is now widely used to treat LN. A second approach, the ‘Euro-Lupus regimen’, consists of prescribing lower doses of intravenous CY for a short period of time followed by long-term immunosuppression with azathioprine (AZA). In a randomised trial, this regimen was shown to achieve results comparable to a high-dose intravenous CY treatment protocol9 10 with a very low rate of end-stage renal disease at 10 years.11 Nevertheless, even on long-term AZA many renal relapses were observed, as in other series from the literature.12 We therefore designed a randomised superiority trial (the MAINTAIN Nephritis Trial) comparing AZA and MMF as long-term immunosuppressive treatment of LN, after a short course of low-dose intravenous CY, in order to test the hypothesis that MMF would reduce renal relapses. Between July 2002 and March 2006, 105 patients were included in the MAINTAIN Nephritis Trial by 27 European centres. All the following inclusion criteria were to be met: age ≥14 years, SLE according to the American College of Rheumatology (ACR) classification criteria,13 24 h proteinuria ≥500 mg, biopsy-proven proliferative WHO class III, IV, Vc or Vd lupus glomerulonephritis (biopsy performed less than 1 month before entry in the protocol), contraception (or sexual abstinence for paediatric patients) and signed informed consent. None of the following exclusion criteria could be met: non-lupus related renal disease (such as microthrombotic disease associated with antiphospholipid syndrome), treatment with glucocorticoids (GCs) (>15 mg equivalent prednisolone/day) in the last month before entry into the study (except a very short-course high-dose oral GC treatment before referral), treatment with CY, AZA, MMF or ciclosporin A in the previous year, pre-existing chronic renal failure (defined as a serum creatinine value above the upper normal value for the local laboratory) due to a previous episode of LN or other cause, pregnancy, breast feeding, previous malignancy (except skin and cervical intraepithelial neoplasias), diabetes mellitus, previously documented severe toxicity of immunosuppressants, anticipated non-compliance with the protocol. This investigator-initiated study did not receive external funding, was registered at http://ClinicalTrials.gov (NCT00204022) and approved by the ethics committees of all participating hospitals. Written informed consent was obtained and the trial was conducted according to the Good Clinical Practice guidelines of the European Medicines Agency. Patients fulfilling the inclusion/exclusion criteria were allocated to the GC/intravenous CY/AZA group (further referred to as the AZA group) or the GC/intravenous CY/MMF group (further referred to as the MMF group) by randomisation, performed at baseline, at the Université Catholique de Louvain (Brussels, Belgium), using minimisation. The following variables were taken into account: centre, age (<20 years; ≥20 and <30 years; ≥30 years), gender, previous SLE-related renal disease (defined as a 24 h proteinuria ≥500 mg), previous GC treatment, WHO class (III; IV, Vc; Vd), cellular crescent(s), glomerular necrotising lesion(s), glomerular and/or interstitial fibrosis, serum creatinine (<1.3 mg/dl; ≥1.3 and <2.0; ≥2.0), serum albumin (≥3.5 g/dl; >2.5 and <3.5; ≤2.5), 24 h proteinuria (≥0.5 and <3 g; ≥3), European Consensus Lupus Activity Measurement (ECLAM) score14 (<5; ≥5) and diastolic blood pressure (<90 mm Hg; ≥90 and <110; ≥110). A detailed treatment protocol is provided in the supplementary material. Briefly, all patients received three daily 750 mg intravenous methylprednisolone pulses (days 1–3), followed by oral GC treatment given on day 4 at an initial dose of 0.5 mg equivalent prednisolone/kg/day for 4 weeks. After 4 weeks, GCs were tapered by 2.5 mg prednisolone/day every 2 weeks, down to 7.5 mg/day at week 24 and to 5 mg/day at week 52. From week 76 onwards, it was strongly advised to taper the steroids further and to stop them if possible. 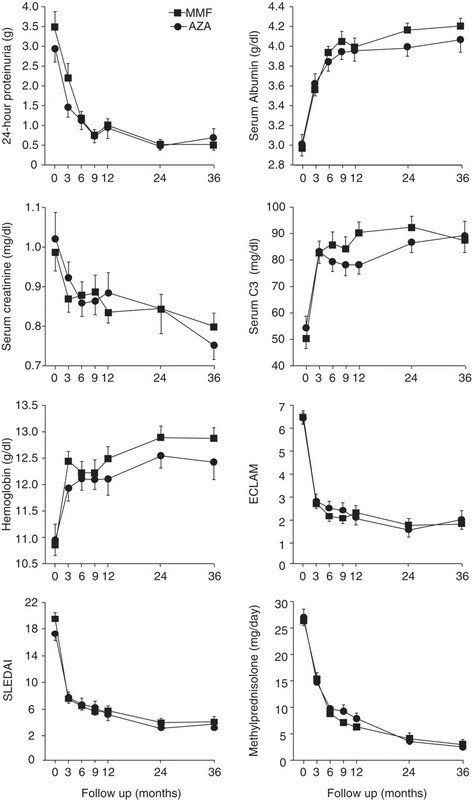 All patients received six fortnightly intravenous CY pulses of 500 mg (fixed dose) within a 10-week period and were then given, from week 12 onwards, AZA (target dose: 2 mg/kg/day) or MMF (target dose 2 g/day), according to randomisation performed at baseline and irrespectively of the magnitude of their renal response at 3 months. Angiotensin-converting enzyme inhibitors (ACEI) were prescribed in all patients with nephrotic-range proteinuria (≥3 g/day). ACEI were prescribed as the first choice treatment in all patients with hypertension (diastolic blood pressure ≥90 mm Hg). The primary end point of the trial was time to renal flare, analysed by survival curves computed, after the Kaplan–Meier method, on the intent-to-treat population. A renal flare was defined as (i) the recurrence or the development of nephrotic syndrome (serum albumin ≤3.5 g/dl and 24 h proteinuria ≥3 g; this type of renal flare is further referred to as ‘nephrotic syndrome’), (ii) renal impairment (≥33% increase of serum creatinine within a 1-month period directly attributed to lupus and confirmed 1 week later; flare referred to as ‘renal impairment’) or (iii) a threefold increase of 24 h proteinuria within a 3-month period accompanied by microscopic haematuria (defined as a number of red blood cells (RBC) per high power field superior to upper normal limit for the local laboratory) and ≥33% reduction of serum C3 level within a 3-month period (this definition of renal flare was only applicable to those patients with low-grade baseline 24 h proteinuria (≥0.5 g and <1 g); this type of renal flare is further referred to as ‘proteinuria increase’). The secondary end points of the trial were the number of severe systemic and benign flares (both defined as described in the supplementary material), the number of patients withdrawing GCs and achieving renal remission. Renal remission was defined as a serum creatinine ≤1.4 mg/dl and a 24 h proteinuria <1 g and a urinary RBC count <10/high power field, according to clinical practice in 2001, when this trial was designed. Of note, renal remission was not a prerequisite to receive maintenance treatment with AZA or MMF and could therefore be reached at any time during follow-up. Disease activity was measured by the validated ECLAM14 and Systemic Lupus Erythematosus Disease Activity Index (SLEDAI)15 scoring systems. Patients could be dropped from the trial for any of the following reasons: death, drug toxicity, pregnancy or pregnancy wish, doctor decision, patient decision (consent withdrawn). The trial was designed as a superiority trial of MMF over AZA. The primary end point (time to renal flare) was used for power calculation. We anticipated a renal flare rate of 35% at 5 years in the AZA group. We defined the clinically meaningful difference as a 10% renal flare rate in the MMF group. To detect such a difference, 51 patients needed to be randomised in each arm to obtain a power of 0.80 with an α level of 0.05. Survival curves were computed using the Kaplan–Meier method and were statistically tested with the log rank test. We calculated the HR and their 95% CIs using the univariate Cox proportional hazards model. Unpaired t tests, χ2 tests and Fisher's exact tests were used as appropriate. Serial data were compared within and between groups by repeated measures analysis of variance, with a ‘between groups’ and a ‘repeated measures’ comparison. All analyses were by intent to treat. A total of 105 patients with biopsy-proven proliferative LN were randomised into the trial (intent-to-treat population). Their demographics and baseline characteristics did not significantly differ between the two groups, as described in table 1. Of note, most patients were Caucasians and had recent-onset kidney disease. In all, 10% of the patients had renal impairment (serum creatinine ≥1.4 mg/dl) and 39% had nephrotic-range proteinuria (≥3 g/day). As depicted in figure 1, 3, patients allocated to MMF withdrew consent during intravenous CY treatment and 24 additional patients (9 in the AZA group and 15 in the MMF group) were dropped from the trial for various reasons. More patients were dropped for pregnancy or pregnancy planning in the MMF group (8/53) compared to the AZA group (2/52; p=0.09 by Fisher's exact test). The timing of the drops is illustrated in the supplementary material. All non-dropped patients had a minimum follow-up of 3 years. Mean (SD) follow-up of the intent-to-treat population was 48 (14) months. Trial profile and patient disposition. AZA, azathioprine; GCs, glucocorticoids; ITT, intent to treat. Serial measurements of 24-h proteinuria, serum albumin, serum creatinine, serum C3, haemoglobin, ECLAM, SLEDAI and tapering of GCs over time. Patients were allocated to the ‘GC/intravenous CY/AZA’ group (circles) or the ‘GC/intravenous CY/MMF’ group (squares) by randomisation. Values are mean±SEM. Repeated measures analysis of variance yielded p<0.005 for all ‘repeated measures’ and p>0.05 for all ‘between groups’ comparisons. Analysis was by intent to treat. Time point of reference for follow-up is from baseline. AZA, azathioprine; CY, cyclophosphamide; ECLAM, European Consensus Lupus Activity Measurement; GCs, glucocorticoids; MMF, mycophenolate mofetil; SLEDAI, Systemic Lupus Erythematosus Disease Activity Index. All patients received 3 g of intravenous CY. To evaluate exposure to AZA/MMF, the maximal and minimal doses taken by each patient throughout the study were identified. Patients from the AZA and MMF group received a mean (SD) maximal daily dose of 124 (33) mg and 2.0 (0.2) g, respectively. The mean (SD) minimal daily doses of AZA and MMF were 100 (38) mg and 1.6 (0.6) g, respectively. Only four and five patients never reached the target AZA or MMF dose, respectively. Time to renal flare, the primary end point of the trial, was compared by Kaplan–Meier survival curves computed for the intent-to-treat population. As shown in figure 2, time to renal flare was not statistically different in the MMF group (10 patients/53; 19%) compared to the AZA group (13 patients/52; 25%). Eight patients from the AZA group and six patients from the MMF group qualified for a renal flare based on the recurrence/development of nephrotic syndrome, two from the AZA group and four from the MMF group based on renal impairment and three from the AZA group based on proteinuria increase (see patients and methods for renal flare definitions). One patient allocated to AZA had two consecutive episodes of renal flare (nephrotic syndrome). Kaplan–Meier probability analysis of renal flare. Patients were allocated to the ‘GC/intravenous CY/AZA’ group (circles) or the ‘GC/intravenous CY/MMF’ group ( squares) by randomisation. Survival curves were statistically tested with the log rank test. Data are HR (95% CI). Numbers shown along the abscissa are the number of patients at risk in each group. Analyses were by intent to treat. Time point of reference for follow-up is from baseline. AZA, azathioprine; CY, cyclophosphamide; GCs, glucocorticoids; MMF, mycophenolate mofetil. Time to severe systemic flares (p=0.99; 4 and 3 episodes in the AZA and MMF group, respectively), to benign flares (p=0.60; 33 and 26 episodes in the AZA and MMF group, respectively), to GC withdrawal (p=0.88; 21 and 20 patients in the AZA and MMF group, respectively; p=0.60) and to renal remission (p=0.11; 47 patients in both groups) did not statistically differ. Figure 3 compares the kinetics of several biological and clinical parameters over a 3-year period. The 24 h proteinuria, serum creatinine, ECLAM and SLEDAI results improved similarly in both groups. Conversely, serum albumin, serum C3 and haemoglobin increased similarly. GC tapering did not differ over time. A subset analysis was performed on patients who, at any time during follow-up, reached a significant renal response defined as a ≥50% reduction of 24 h proteinuria (n=98; 48 in the AZA group and 50 in the MMF group). Importantly, a similar number of patients had a renal flare in the AZA (n=7) and the MMF group (n=7) after having achieved at least a 50% drop in 24 h proteinuria. Time to renal flare, computed from the time a ≥50% reduction of 24 h proteinuria was achieved, did not differ by Kaplan–Meier analyses (p=0.97; data not shown). Seven patients (four from the AZA and three from the MMF group) doubled their serum creatinine at last follow-up. Two of them (one from each group) developed end-stage renal failure and required renal replacement treatment. Two patients (both from the MMF group) died, the first from Legionella pneumophilia sepsis at month 36, after a renal flare at month 3 and doubling of serum creatinine at month 24; the other died from SLE at month 45, after a severe systemic flare at month 44. All other adverse events are listed in table 2. None was statistically more frequent in one group compared to the other, with the exception of haematological cytopenias, which were more frequent in the AZA (14 episodes: 11 leucopenia, 2 anaemia and 1 combination of leucopenia and anaemia) compared to the MMF (2 episodes of leucopenia) group. Time to first haematological cytopenia was statistically shorter in the AZA group (p=0.033; HR (95% CIs) AZA: 4.54 (1 to 21)). Complete haematological recovery was achieved by per protocol dose adjustment of the immunosuppressant in all cases, but in one patient from the AZA group who was dropped. Six additional patients (four AZA and two MMF) were dropped from the trial for drug toxicity, namely severe gastrointestinal intolerance in three AZA group patients and one MMF group patient and hepatitis in one AZA group patient and one MMF group patient. In this investigator-initiated multicentre randomised long-term maintenance trial, MMF was not significantly superior to AZA in preventing renal flares in patients with proliferative LN, with a renal relapse rate of 19 and 25% in the MMF and AZA group, respectively. Time to severe systemic flare, benign flare, GC withdrawal and renal remission did not differ between the two groups. Drug-related toxicities were similar except for cytopenias, which were more common in the AZA group but were readily controlled by dose adjustments and led to only one patient dropping out. Several caveats can be raised. First, MAINTAIN is a relatively small size European-based investigator-led clinical trial with mainly Caucasian patients rather than a large international multiethnic study. Second, it was an open label and not a double-blinded trial. It should be stressed, however, that the primary outcome (that is, renal relapse) was strictly defined on biological grounds and therefore unlikely to have been influenced by knowledge of patient allocation. Third, the trial design can be criticised as we did not request patients to have a significant renal response before starting maintenance treatment with AZA or MMF. This was a deliberate choice as we felt that such a design more closely paralleled clinical practice, including patients even if they did not satisfactorily respond after 3 months of induction treatment. Strictly speaking, MAINTAIN is a comparison of a ‘GC/intravenous CY/AZA protocol’ versus a ‘GC/intravenous CY/MMF protocol’. Importantly, a subset analysis performed on patients who, at any time during follow-up, achieved a significant renal response defined as a ≥50% reduction of 24 h proteinuria, showed similar renal flare rates in the two groups, thereby ruling out a major design bias. Fourth, serum measures of the active metabolites of AZA (ie, 6-thioaguanines (6-TGN)) or of MMF (ie, mycophenolic acid (MPA)) were not routinely performed, leaving open the possibility that patients who failed on one or the other drug were actually underdosed or non-adherent to the medication. This hypothesis might not be too far fetched based on the recent finding that patients who have undergone kidney transplant had a lower rejection rate if MMF doses were titrated according to serum MPA titres instead of fixed.16 Finally, the decision to design a superiority instead of an equivalence trial placed MMF in a more challenging position. MMF and AZA were also compared for maintenance treatment of LN after induction treatment with pulse intravenous CY by Contreras et al17 Patients included in this trial were almost entirely non-Caucasians and had severe LN. Six AZA-treated and three MMF-treated patients had a renal relapse, but this difference was not statistically significant due to the small number of patients in each group. 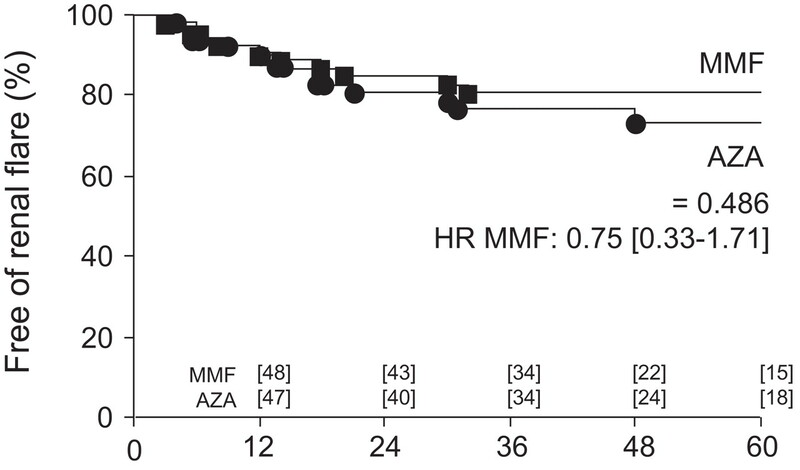 During the review process of this manuscript, we became aware that the maintenance phase of the Aspreva Lupus Management Study (ALMS), also comparing AZA and MMF for maintenance immunosupression of LN, met its primary end point: MMF was found to be superior to AZA in delaying the time to treatment failure, a composite index comprising death, serious renal damage and relapse of LN.18 Although more data are eagerly awaited before conclusions can be drawn, several reasons for the discrepancy between the results of MAINTAIN and ALMS can already be hypothesised, such as inclusion of patients from different ethnic groups in ALMS, a different trial design (only patients having achieved a renal response at 6 months were included in the maintenance phase of ALMS) or a different primary outcome measure (a composite end point in ALMS). However, the major reason for the difference may well stem from the numbers of patients randomised in the 2 trials (105 and 227 in MAINTAIN and ALMS, respectively). However, two arguments can be advocated in favour of AZA. First, AZA can be safely used during pregnancy whereas MMF is absolutely contraindicated. MMF is likely a human teratogen based on the unusual distribution of malformations observed among reported exposed offspring (microtia or anotia, external auditory canal atresia, orofacial clefts, hypertelorism, coloboma, microganthia and cardiovascular malformations).24 When long-term immunosuppression is being considered in young women planning pregnancy, this issue needs to be appreciated, as indeed suggested by the trial reported here where patients dropping out for pregnancy or pregnancy planning were more frequently observed in the MMF arm compared to the AZA arm. Second, the cost of MMF is currently 10 times higher than that of AZA. Although the next availability of MMF generics might reduce these costs, it could be part of the decision at the bedside. In conclusion, there were fewer renal flares seen in the MMF-treated patients but this did not reach statistical significance and we were not able to demonstrate the superiority of MMF over AZA. However, the data from the MAINTAIN Nephritis Trial suggest that at least two drugs are available for long-term use in patients with LN, with a reasonable efficacy and an excellent toxicity profile. The possibility that some patients who fail on one immunosuppressant could be successfully rescued by switching to the other was not addressed in this study, but is in a very reasonable consideration. A welcome step forward would consist of a priori identification of those patients who will respond to one or to the other drug, as well as the search for even more effective maintenance therapies. In this respect, the place of targeted treatment with biologicals clearly needs further investigation. We are most grateful to Jean-Pierre Cosyns, for contributing to the renal pathology analyses, to Yves Pirson and Michel Jadoul, for many interesting discussions and to Jacques Jamart for help in the randomisation procedure.
. Lupus nephritis. J Am Soc Nephrol 1999;10:413–24.
. Relapses of lupus nephritis: incidence, risk factors, serology and impact on outcome. Lupus 2003;12:692–6.
. Disease activity in systemic lupus erythematosus: report of the Consensus Study Group of the European Workshop for Rheumatology Research. II. Identification of the variables indicative of disease activity and their use in the development of an activity score. The European Consensus Study Group for Disease Activity in SLE. Clin Exp Rheumatol 1992;10:541–7.
. Individualized mycophenolate mofetil dosing based on drug exposure significantly improves patient outcomes after renal transplantation. Am J Transplant 2007;7:2496–503.
. Sequential therapies for proliferative lupus nephritis. N Engl J Med 2004;350:971–80.
. Aspreva Lupus Management Study maintenance results. Lupus 2010;19(Suppl):27 (CS12.5).
. Prevalence and correlates of accelerated atherosclerosis in systemic lupus erythematosus. N Engl J Med 2003;349:2399–406.
. Antifibrotic actions of mycophenolic acid. Clin Transplant 2006;20(Suppl 17):25–9.
. Preventing cardiac allograft vasculopathy: long-term beneficial effects of mycophenolate mofetil. J Heart Lung Transplant 2006;25:550–6.
. A randomized controlled trial of mycophenolate mofetil versus placebo on surrogate markers of atherosclerosis in systemic lupus erythematosus. ACR/ARHP Annual Scientific Meeting. Arthritis Rheum 2009;(Suppl):103A.
. Mutagenicity and potential carcinogenicity of thiopurine treatment in patients with inflammatory bowel disease. Cancer Res 2009;69:7004–12.
. Reviewing the evidence for mycophenolate mofetil as a new teratogen: case report and review of the literature. Am J Med Genet A 2009;149A:1241–8. The members of the MAINTAIN Nephritis Trial group are the coauthors and: Daniel Abramowicz, Nephrology Department, Hôpital Erasme, Université Libre de Bruxelles, Brussels, Belgium; Fabiola Atzeni, Unita Operativa di Reumatologia, Ospedale Luigi Sacco, Milan, Italy; Maria Giovanna Danieli, Istituto di Clinica Medica Generale, Universia Degli Study di Ancona, Torrette di Ancona, Italy; Luc De Clercq, Rheumatology Department, Sint-Augustinus Ziekenhuis, Wilrijk, Belgium; Filip de Keyser, Rheumatology Department, UZ Gent, University of Ghent, Ghent, Belgium; Michel Delahousse, Service de Nephrologie, Hôpital Foch, Paris, France; Gerard Espinosa, Department of Autoimmune Diseases, Hospital Clinic, Barcelona, Catalonia, Spain; Marc Golstein, Service de Rheumatologie, Cliniques Saint-Jean, Brussels, Belgium; Marco Hirsch, Luxembourg, Grand Duchy of Luxembourg; Alexandre Karras, Service de Néphrologie, Hôpital Européen Georges Pompidou, Paris, France; Philippe Lang, Nephrology Department, Hôpital Henri Mondor, Créteil, France; Martine Marchal, Service de Néphrologie, Hôpital de Tivoli, La Louvière, Belgium; Antonio Marinho, Clinical Immunology Unit, Hospital Santo Antonio, ICBAS, Porto, Portugal; Regina Max, Department of Internal Medicine V, University of Heidelberg, Heidelberg, Germany; Patrick Peeters, Nephrology Department, UZ Gent, University of Ghent, Ghent, Belgium; Peter Petera, Zentrum für Diagnostik und Therapie rheumatischer Erkrankungen, Krankenhaus Lainz, Wien, Austria; Thomas Quémeneur; Centre Hospitalier Régional Universitaire de Lille, Lille, France; Frank Raeman, Rheumatology Department, Jan Palfijn Hospital, Merksem, Belgium; Piercarlo Sarzi-Puttini, Unita Operativa di Reumatologia, Ospedale Luigi Sacco, Milan, Italy; Lucia Valiente de Santis, General Internal Medicine, Hospital Regional Universitario Carlos Haya, Malaga, Spain; Luc Verresen, Nephrology Department, Ziekenhuis Oost-Limburg, Genk, Belgium; Laurence Weiss, Département d'Immunologie, Hôpital Européen Georges Pompidou, Paris, France; René Westhovens, Rheumatology Department, UZ Gasthuisberg, Katholieke Universiteit Leuven, Leuven, Belgium. Ethics approval This study was conducted with the approval of the Cliniques Universitaires Saint-Luc, Université Catholique de Louvain, Belgium.